This weekend retreat is devoted to the practice of Green Tara, the mother of all Buddhas, who embodies swift and fearless compassion in action, like Akong Tulku Rinpoche whose Tibetan Monastery bears her name. The course will give participants the instruction, authorisation and empowerment needed for practising Green Tara Sadhana. Suitable for those who have taken Refuge. Ani Rinchen Khandro will explain the meaning and benefits of Green Tara practice and give instruction on the text, including visualisations, mantras, mudras, music, praises and offerings. Please bring a pencil, a red pen and your text for marking, or email us in advance if you wish to purchase a text on the day. 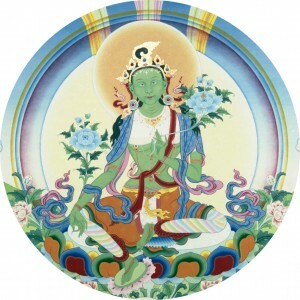 Tulku Ogyen has kindly offered to bestow the Green Tara Empowerment and Authorisation as a blessing and to give people the wherewithal to do this most precious practice. Participants may give a Kata (white scarf) or offerings during the ceremony if they wish. Katas will be available to purchase on the day. Dedicated to the swift return of Akong Tulku Rinpoche, the long life of Lama Yeshe Rinpoche and the benefit of all sentient beings. Everyone welcome. KSDE will be closed during May while we will move to our new centre in LeithKSDE’s usual weekly programme will be suspended in May to allow us to move from Walker Street to our new centre at 25 Bernard Street, Leith. Our new centre will be inaugurated on Saturday May 21st 2016, with the new programme commencing from June 2016. On this most auspicious day of the Buddhist calendar Lama Yeshe Rinpoche will inaugurate the new Kagyu Samye Dzong Edinburgh Dharma Centre for the benefit of all beings. You are cordially invited to join us on this spiritually meaningful and joyous occasion in the history of Kagyu Samye Dzong Edinburgh. 4pm – Feasting and celebration! Sunday June 12th 2016, 10.30am – 4.30pmIn Part 3 of this 4 Part Course Ani Rinchen will present the deep, and often misunderstood topic of Karma. Using study, reflection, discussion and meditation we will explore the meaning of Karma and examine how it affects our lives and the world around us. Please note, this course is for people who have already attended parts 1 and 2. 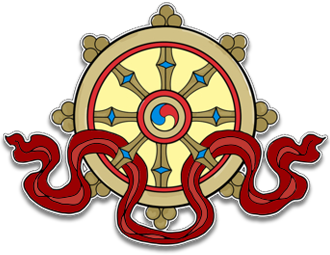 Dharma Teachings with Ringu Tulku Rinpoche – Life, Death and The Bardo (June 29th & 30th 2016) – Event Full! 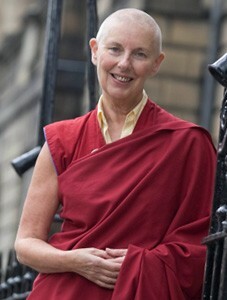 We are delighted to welcome Ringu Tulku Rinpoche to our new Centre in Leith. 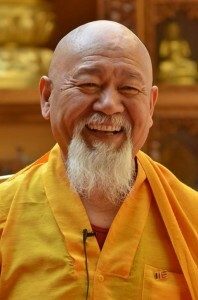 Rinpoche’s erudition, excellent English and easy manner allows him to present the Buddhist view on profound topics such as these in a most accessible way. Saturday July 16th 2016, 10.30am – 4.30pmIn this final part of the course we will go beyond the superficial, worldly way of seeing to examine how things truly are. By developing our awareness through study, contemplation and meditation and applying it in daily life, we open our minds and deepen our understanding. These preliminary foundations are an invaluable support throughout life and may also serve as the basis for taking Refuge in the Buddhist Faith, practising the Four Extraordinary Foundations and further teachings leading to liberation. Please note, this course is for people who have already attended parts 1, 2 and 3. Lama Yeshe Rinpoche will be conducting the Refuge Ceremony at KSDE during the weekend of September 24th/25th 2016. KSDE will be closed throughout the month of AugustAfter the momentous events of this summer, KSD Edinburgh will close for its annual Summer Break throughout August. This will enable our hard working volunteers to take a well earned rest and/or attend the Drubcho Ceremonies at Samye Ling. We wish you all well over the holidays and look forward to see you again in September. KSDE will re-open for the Autumn Term on Monday September 5th. Saturday 24th & Sunday 25th September 2016 Lama Yeshe Rinpoche is Abbot of Samye Ling and of Samye Dzong Centres worldwide. A renowned meditation Master and charismatic teacher, his wisdom, compassion and humour make him an inspiring example for us all. Ani Rinchen Khandro will explain the meaning of taking Refuge for those who wish to formally join the Buddhist faith and participate in the Refuge Ceremony with Lama Yeshe Rinpoche. Please inform the office ahead of time if you wish to take Refuge. The ceremony is for participants only, although family and friends are welcome. Lama Yeshe Rinpoche and VIP Guests will cut the ceremonial ribbon to formally open Kagyu Samye Dzong Edinburgh, followed by welcome address and speeches in the Shrine Room. The weekend culminates in thanksgiving prayers and a sacred feast to celebrate the opening of KSD Edinburgh as a beacon of wisdom, peace and harmony for all beings. Simple food offerings to share may be brought if wished. Saturday October 22nd 2016, 10.30am – 4.30pm This is a follow up course for those who have been practicing The Four Ordinary Foundations, have taken Refuge and are ready to progress further. 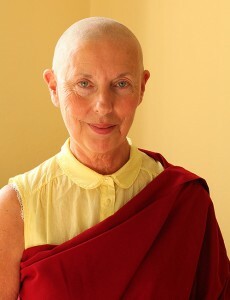 Ani Rinchen Khandro presents an overview of the Four Extraordinary Foundation practices. Emphasis will be given to the first practice of Refuge and Bodhicitta and will include instruction on meditation, visualisation and prostrations. Texts will be available to buy. Thursday October 27th 2016, 7pm – 9pm Drupon Rinpoche is widely recognized as one of the most learned Dharma teachers and Retreat Masters of today. Please visit druponrinpoche.org for more information about Rinpoche and his extensive activities. We are extremely honoured that Rinpoche is teaching at KSDE on the all important topic concerning the difference between blind faith and authentic faith in Buddhism. This is Dharma gold for anyone wishing to inform their personal practice and deepen their understanding of the Buddhist view. Sunday November 13th 2016, 10.30am – 4.30pm The vast scope and range of Buddhist teachings can seem daunting. 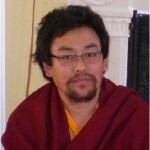 Ani Rinchen will begin at the beginning with an overview of the life of the Buddha and history of the main tenets common to all schools of Buddhism. The afternoon session will focus mainly on the Tibetan Vajrayana tradition and the importance of following an authentic lineage. There will also be time for questions, discussion and short meditations. Saturday November 26th, 10.30-11.30amThis Saturday’s Chenrezi Puja is dedicated to the victims of war and particularly the children of Aleppo. In keeping with the Light for Aleppo initiative by our friends at Edinburgh University chaplaincy, we will light candles to symbolise the power of prayer to illuminate the darkness of war with the light of loving kindness and compassion. Saturday December 3rd 2016, 10.30am – 4.30pmOn the Anniversary Birthday of Mikyo Dorje, the illustrious 8th Karmapa, Ani Rinchen presents an overview of the precious Karmapa Lineage from the 1st to the present day 17th, His Holiness Ogyen Trinley Dorje. The course concludes with a film of inspirational recent teaching by His Holiness. Wednesday December 7th 2016, 6.30-7.30pmYou are welcome to join us on Medicine Buddha Day for prayers and meditation on Medicine Buddha for the healing of our world, ourselves and all beings. Saturday December 17th 2016, 10.30-11.30amAn opportunity to come together on the last day of term and meditate on cultivating peaceful minds that lead to the spreading of peace and joy on earth. Those who wish to, can stay on and help give the Centre a wee clean and tidy up. Who knows, there may even be tea and mince pies!